Usually I like to discuss the pros and cons of a particular element of food storage. I like to weigh the benefit versus the cost of the conventional and organic varieties. There is one “food” that has become so toxic and so polluted that I will not have it in my home. This crop is so far removed from the original maize grown here on the North American continent that it has become another species, viciously spearing tractor tires until they have had to be replaced with Kevlar – that’s right – the same material used for bullet resistant body armor. 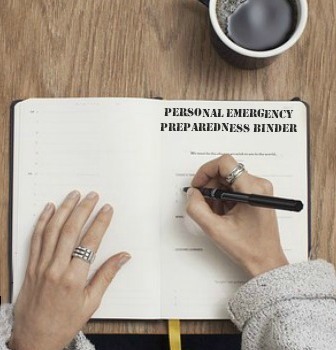 There are no pros – not one. Only cons. Up to 85% of corn grown in the United States is genetically modified. Up to 65% of corn grown in Canada is genetically modified. 115,000 hectares of GM corn is grown in Spain, mostly for use as animal feed – this corn is sold to farmers in the US, Argentina, and Brazil and fed to livestock, further poisoning the food supply. China will begin to grow the country’s first commercial GM corn in 2013. As you can see by the numbers above, if you are a gambling person, the odds are that any food purchased in North America which contains corn is more than likely tainted by genetic modification. If you’re wondering why that’s so bad, take a look at this photograph. 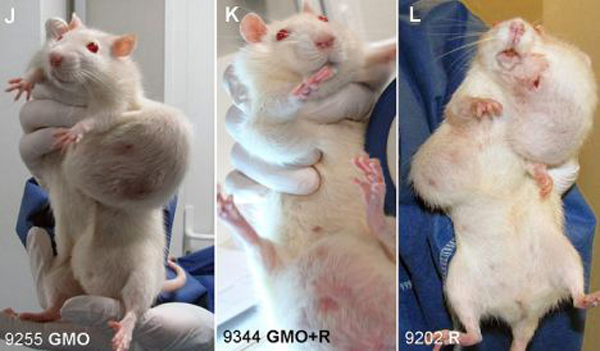 It really doesn’t even require explanation when you see these poor rats who were fed a lifetime diet of GMO corn. Here’s the study for anyone who wants to read straight from the abstract. It is called the Seralini Study and it took place in France. Even the mainstream media seem shocked by the study, as evidenced by articles in Business Insider and the UK Guardian. Monsanto’s public relations folks worked overtime, rallying quickly to dispute the study. Forbes Magazine and the BBC obediently published the rather biased findings of Monsanto’s studies. (It’s interesting to note that the French study took place over the 2 year life span of rats, while the Monsanto studies took place over a period of 3 months.) Forbes went all out, attacking the study in dozens of articles. The reason that GMO corn is so toxic is twofold. First is “round-up ready” corn. This corn, known as NK603 Roundup-resistant genetically modified corn – is engineered to be able to withstand heavy spraying of Round-up weedkiller, also made by Monsanto. So, in essence, farmers can inundate the soil and plant with weed killer, and everything but the corn will die. Both the GMO corn and the Round-up weedkiller are toxic to mammals, according to the French study. Next is Monsanto’s genetically modified “Bt” corn contains a gene extracted from soil bacteria. This pesticide, when consumed, breaks open the stomach of certain insects and kills them. A study that took place at Sherbrooke University Hospital in Quebec found Bt toxin has been detected in the blood of 93 percent of pregnant women tested; 80 percent of babies; and 67 percent of non-pregnant women. The health threat doesn’t just end with cancer. According to an article by Jeffrey Smith on Mercola.com, Bt toxin also triggers immune response issues. In government-sponsored research in Italyii , mice fed Monsanto’s Bt corn showed a wide range of immune responses. Their elevated IgE and IgG antibodies, for example, are typically associated with allergies and infections. The mice had an increase in cytokines, which are associated with “allergic and inflammatory responses.” The specific cytokines (interleukins) that were elevated are also higher in humans who suffer from a wide range of disorders, from arthritis and inflammatory bowel disease, to MS and cancer (see chart). The evidence above is quite sufficient for me to say, without equivocation, that there is NO WAY I am feeding that stuff to my family. Any corn products that come into our home are strictly organic. There is no exception to this rule. 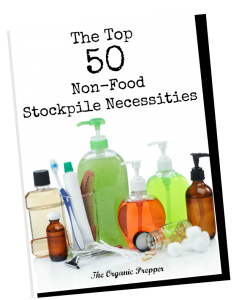 If the day comes when you are relying on your food storage, whether it’s because of dramatic inflation, a world-changing disaster, or a SHTF event, picture those tumorous rats – that is the future I envision if I stockpile these “foods” just because they are a little bit cheaper. Either boycott corn items altogether or purchase only organic corn items. Now….about those corn items. Not all corn comes on a cob. In fact, these days, most of it comes in a box, can or cellophane wrapper. Did you know that more than 70% of processed food contains corn in some form or another? When you consider that 91% of corn in North America is GMO, and 70% of processed food contains corn, the simple math tells you that if you buy processed foods, you are most likely buying GMO corn. The best information I’ve found for avoiding corn is on this website: Corn Allergens. Now, I don’t have a corn allergy but many people do – serious anaphylactic reactions. Because of this immediately life-threatening issue, the website is a virtual compendium of all things corn. I was very surprised to learn the everyday items that contain corn, most likely from a genetically modified origin. In addition to the items on this list not including everything that contains corn, not everything on this list will contain corn. It is that they can contain corn, and therefore may need to be outright avoided or used cautiously. Read more about this on the Corn Allergens as Ingredients page. The items identified with an asterisk * are the most common items that might not always contain or be derived from corn. Proceed with caution! This doesn’t mean you can never eat corn again! I just purchased 50 pounds of organic cornmeal and plan to grow a big patch of corn in my garden this year (heirloom variety, obviously!) If there is only one food you avoid in your long term food storage, please, make it commercial corn.